I have lived long enough to collect, 45' albums, tapes and CD's. And I need plenty of storage for my collection. It's handy, compact. It can easily be cleaned off, hide in closet, can be transported easily. Ihave ur dvd,cd & lp holders, I love them.light weight & able to see what's in them.plus u have great prices and have a huge variety of items. AND THEY'RE EASY TO HANDLE WHEN FULL. Filled them up as soon as they arrived,I am very satisfied with these cases. This product is great. They fit so well inside bookcases making it easy to view each CD. Almost didn't buy this because of other reviews, glad I tried it. My zipper works just fine, and the fit is perfect for cd. Its actually larger than I expected from the reviews. Great for get aways and vacations. Great fro storing CD's and keeping the dust off of them. these storage cases are awesome! These storage cases are awesome! Can slide them anywhere. Easy to read the movie titles. Keeps them dust free. Perfect storage for CDs. I am more than satisfied. Clear Plastic is a heavier weight. Nylon woven top and bottom. Has 2 built in plastic dividers right around where the handles are attached. Holds CD's perfectly. Some complained about stitching separating from the case, but mine was fine. Only has 1 zipper. Great for storing not only music but older software jewel cases. If you use thin cases, you can get twice the storage. Slender design makes it easy to store in the car too. I give this item 2 thumbs up and will buy again. 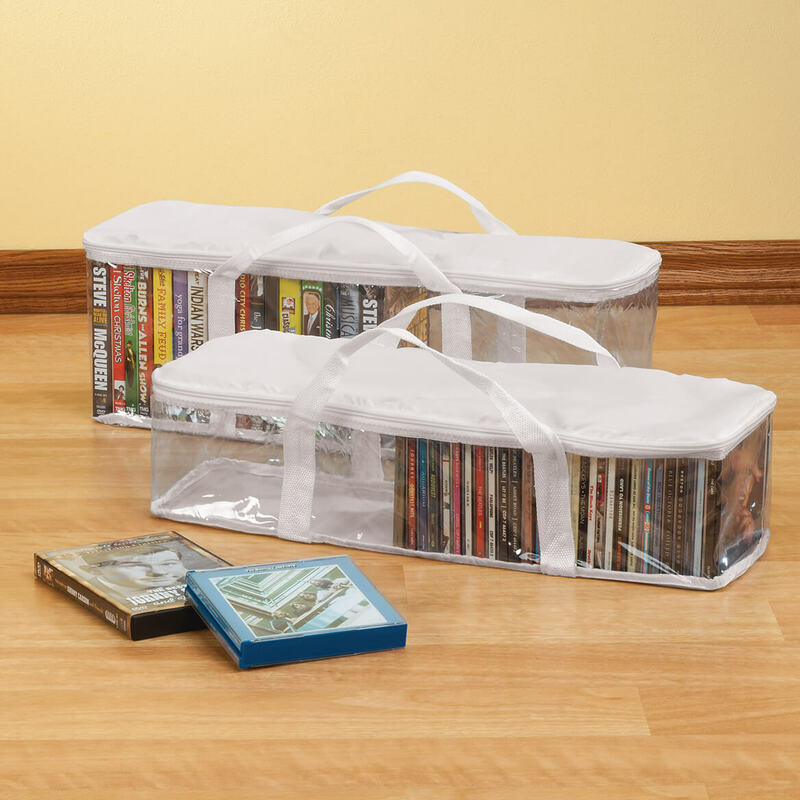 I have purchased these before and found them to be very versatile in storing CD's and DVD's.The product is also great when needing more space in your home as they do not take up a lot of space. I would definitely buy another one of these. This cd case holds a lot of cds. Getting ready for a move. Packing is easier with this storage case. Great product easy to store cd's. I can store about 58 cd's in the container. Great for storing CD's. They can be seen excellently for a quick browse. I was storing my CD's in a drawer and never find the one I am looking for. I will be buying more in order to categorize music genres. I was looking for a way to organize 100 CD's on a shelf. This was perfect and a great price. Happy withe design of the case. I like the capacity of the case. The design is very portable to carry. My sons have all their music downloaded onto their computer, Ipods, and phones. So they don't even open the CD's anymore. 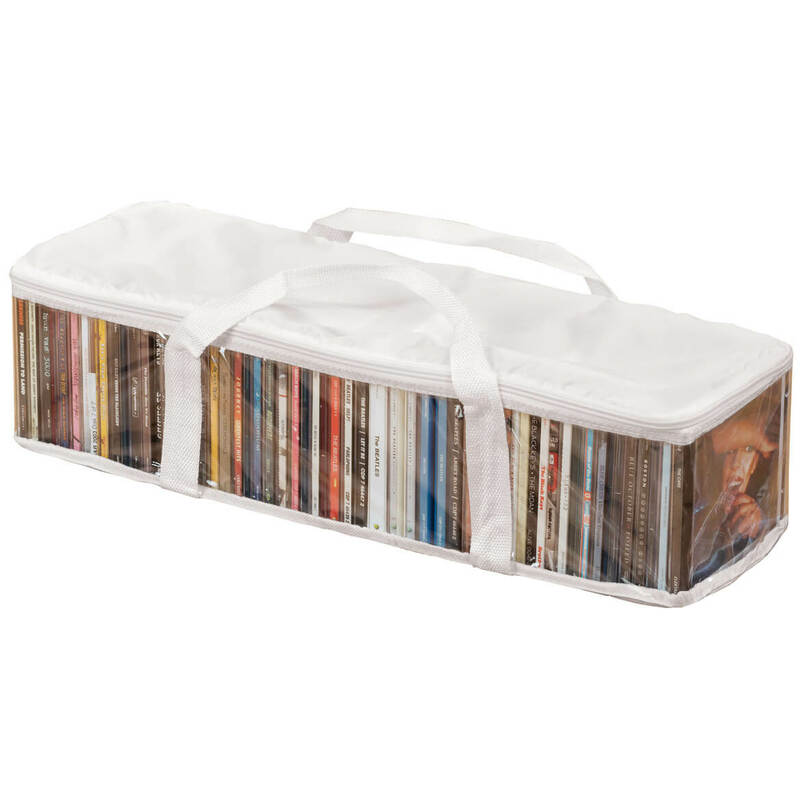 So these storage containers for 50 CD's are perfect for healthy storage of their music CD's. Also, while they all may be stored in a out of sight location, if they want to have easy access to these CD's it is easy to see what they have in the storage containers through the clear plastic walls. I use the product to keep CDs together in one place. It's easy to move about and keep things neat. Very good capacity. The bottom of the product should be a piece of heavy cardboard or lightweight wood or plastic that can be removed when the carrier is empty so that it can be folded up for storage. At the moment, the latter is my only con. We have a lot of CD's to organize in our household. I like the fact that you can easily store, move around, and view the CD's. after cleaning cds real good i stored them in these and they are very good at keeping cds dust free. I like it, but needs to have a flat hard bottom. This serves the purpose that I wanted, but it is very cheaply made and I'm sure it would not hold up to constant use. I just wanted something to store my CD's in. If I needed to get to them on a regular basis this would not be the thing to use. Not good quality. I put a few CD's in it just to check the fit. With just a few CD's in case, I tried to close it and the seam ripped. Will be sending back. 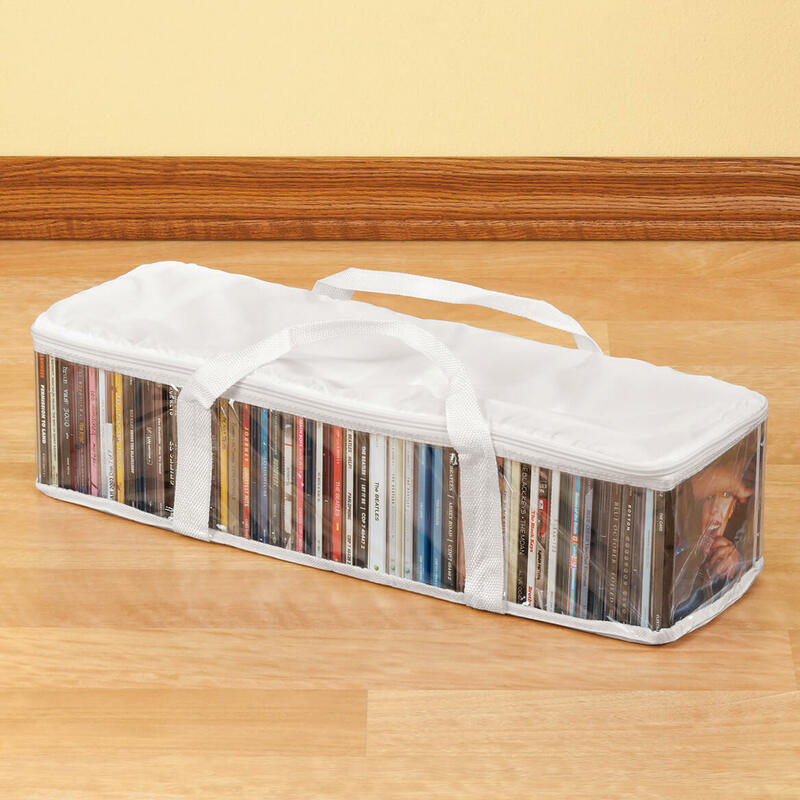 I saw this in the catalog and thought it was a great way to store my CD cases. It would be, if it weren't so poorly made. I bought two, and the first one ripped when I tried to zip it, and the second one was already ripped when I opened it. And the CDs didn't fit properly. So while I think it's a great concept for CD storage, I wish it were better quality. WASTE OF MONEY! CDS DON'T FIT! The previous comments about CDs not fitting are absolutely correct. I do not know why they are included in Miles Kimball product line. We tried every which way and they do not fit....period! We are upset because Miles Kimball does not provide a postage paid return label and states in their return policy that they may charge you shipping/handling in regards to the return.....that would be on top of the postage spent to return them. Very irritating! Evidently they have changed the sizing of this product since most of you wrote your reviews. The photo of the CD storage case shows CDs in their cases. There is no way the case can zip up with CD cases inside. I purchased the LP storage cases and they were great, so I did not hesitate to purchase these. Very disappointed in this product. This is a great way to store your C D'S. Glad I found them. Jan M.
I can see that CD's inside from outside the case without having to open it, and go through all of them. Good for storage and keeping all items protected and easy to see when needed. To keep all my Christmas cds together. The see-thru case is also quite helpful in making my immediate choices. I thought it would be good for my wife to see what she has available in her CD's when we travel. this will work to keep all of my covers in place as I put most of my cds in the car. The handle looks helpful too! Got tired of storing my priceless CDs in cardboard boxes. Now my Frank Sinatra, Barry Manilow, Steve Tyrell, and Spanish CDs will be well preserved. I have lots of DVD's & VHS that I want to store but be able to find what I need without digging thru boxes. I have a lot of CD's. I want them all together. I have lots of CD. Want to keep it dust free. In my price range. See thru w handle. To organize my many CD's and will make finding one easier with clear case. Needed portable storage with see thru clear plastic for easy identification. We are in the process of organizing out music CD's and I have searched for the perfect storage container. This was the most affordable and the right size to fit where we wish to store them. I needed a way to organize my CDs and this was inexpensive. It is handy to keep them in place and easy to move about if necessary. Holds a lot but be careful the nylon rips easily. I chose these to become more organized. I have some of these and with the overflow of CDs I have, it a great way to store them. Put into "take along" containers for our 5th wheel Camper. Needed one that would keep dust out. is this made of all flexible plastic or part hard and soft? BEST ANSWER: It's all flexible plastic. There's a softer, white, quilted, thin plastic material on the top and bottom and a thicker, sturdier clear plastic on the sides. There are two clear dividers on the inside that separates the sections every 12 CD's, which helps if it's not full that they're not all sliding around. They are easy to stack on top of one another, so you can get a lot of CD's stored in a small space. And it's sturdy enough to carry around. It would have been nice if there were thick cardboard on the top and bottom, but it works without it. It's all soft and flexible. I have it full of CD's, sitting on the floor inside my car. It is made of all flexible plastic and polyester fabric. Looks to be nice construction. IT is all flexible plastic and we have found it to be very handy. Flexible plastic; folds nicely too. How many CD's does the storage case hold? BEST ANSWER: I have 55 in one case not all the cd cases are the same size so this number could change depending on case size. Great storage, I can stack them and see what is inside. Thank you for your question. It holds up to 50 CDs. We hope this information will be of help to you. Does this item comes in black? BEST ANSWER: Thank you for your question. No it does not. We hope this information will be of help to you. Why a shipping charge? The catalog I'm ordering from offers free shipping. Do you have plastic cases for DVD's? BEST ANSWER: Thank you for your question. We do offer a DVD storage case on our website. The DVD storage case can be found on our website by searching for item number 331305. We hope this information will be of help to you.